Air Creebec Inc. is a regional airline based in Val-d'Or, Quebec, Canada. It operates scheduled and charter services to 16 destinations in Quebec and Ontario. 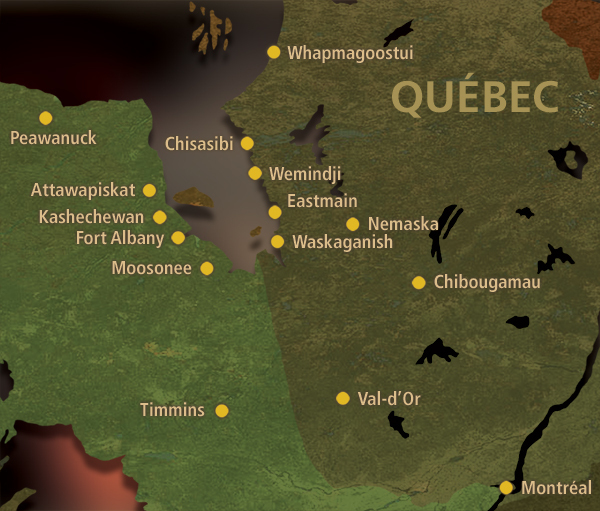 Its main base is Val-d'Or Airport, with a hub at Timmins/Victor M. Power Airport. The airline was established in June 1982 and started operations on 1 July 1982. At that time the Cree owned 51% of the company and Austin Airways owned the remaining 49%. In 1988 the Cree purchased all the airline assets in the largest commercial deal to that date performed by any aboriginal group in Canada, making Air Creebec owned entirely by the Cree. On 23 March 2012, Air Creebec discontinued its service to La Grande Rivière Airport. The airline offers Aeroplan rewards points, both to collect and to redeem. ^ a b c "Canadian Civil Aircraft Register: Quick Search Result for Air Creebec". Transport Canada. Retrieved 2017-12-27. ^ a b c "Air Creebec Destinations". Archived from the original on 19 November 2014. Retrieved 15 January 2016. ^ Contact Us Archived 19 July 2012 at Archive.today. Air Crebeec. Retrieved on 29 June 2010. "101, 7th Street Val-d'Or, Quebec J9P 4P4" Address in French: "101, 7e Rue Val-d'Or (Québec) J9P 4P4"
^ "Directory: World Airlines". Flight International. 27 March 2007. p. 55. ^ "Discontunuance of a domestic services to La Grande (press release)". Air Creebec Inc. 15 March 2012. Archived from the original on 4 March 2016. Retrieved 28 March 2012. Wikimedia Commons has media related to Air Creebec.